Owning an almost audacious amount of coastline, Belize's geographic location is given to diverse travelling. The entire coast is sidelined by a barrier reef, making for exceptional diving opportunities. But head a little inland and you will discover many more attractions. Hundreds of Mayan ruins have been discovered in Belize's heartland and well organized tours make these fantastic sites to visit, their attraction accentuated by enjoyable nature trips. Unfortunately, Belize remains a somewhat difficult country to travel around. Apart from a handful of established tourist attractions, Belize is yet to fully realize its spectacular potential as a crowd drawer. In the meantime, much of Belize is still for the hardy traveller. The history of Belize dates back thousands of years. The Mayan civilization spread into the area of Belize between 1500 BC and AD 200 and flourished until about AD 1200. 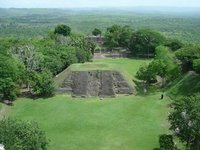 Several major archeological sites - notably Caracol, Lamanai, Lubaantun, Altun Ha, and Xunantunich - reflect the advanced civilization and much denser population of that period. Some lowland Maya still occupied the area when Europeans arrived in the 1500s. By then the primary inhabitants were the Mopan branch of the Yucatec Maya. European contact began in 1502 when Christopher Columbus sailed along the coast. The first recorded European settlement was established by shipwrecked English seamen in 1638. Over the next 150 years, more English settlements were established. This period also was marked by piracy, indiscriminate logging, and sporadic attacks by Indians and neighboring Spanish settlements. Great Britain first sent an official representative to the area in the late 18th century, but Belize was not formally termed the "Colony of British Honduras" until 1840. It became a crown colony in 1862. In the 1880s and 1890s, Mopán and Kekchí Maya fled from forced labor in Guatemala and settled in several villages in southern British Honduras. Under the policy of indirect rule, a system of elected alcaldes (mayors) linked these Maya to the colonial administration. However, the remoteness of their settlements resulted in the Mopán and Kekchí Maya becoming less assimilated into the colony than the Maya of the north, where a Mestizo culture emerged. The Great Depression of the 1930s caused a near-collapse of the colonial economy as British demand for timber plummeted. The effects of widespread unemployment were worsened by a devastating hurricane that struck the colony in 1931. Demonstrations and riots in 1934 marked the beginning of an independence movement. Britain's decision to devalue the British Honduras dollar in 1949 worsened economic conditions and led to the creation of the People's Committee, which demanded independence. Constitutional reforms were initiated in 1954 and resulted in a new constitution ten years later. Britain granted British Honduras self-government in 1964, and the head of the PUP—independence leader George Price—became the colony's prime minister. British Honduras was officially renamed Belize in 1973. Independence came to Belize on September 21, 1981 after the Belize Act 1981, without reaching an agreement with Guatemala which didn't recognize this new country. Throughout Belize's history, Guatemala has claimed ownership of all or part of the territory. This claim is occasionally reflected in maps showing Belize as Guatemala's twenty-third province. Belize borders Mexico to the north and Guatemala to the west and south, and the Caribbean Sea to the east, with 386 kilometres of coastline. It has a total of 516 kilometres of land borders, about equally divided between Mexico and Guatemala. In total, Belize is 22,960 km²big, making it one of the smaller countries (apart from the Caribbean islands) in the western hemisphere. Belize is the only English-speaking country in Central America and the only one without a Pacific coastline. There are many coral reefs, cays, and islands to the east, like Ambergris Caye, Caye Caulker, the Lighthouse Reef, Glover Reef, and the Turneffe Islands. 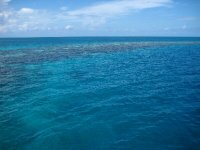 Together they form the Belize Barrier Reef, with 322 kilometres being the second longest in the world after the Great Barrier Reef. The country's largest river is the Belize River. The Hondo and the Sarstoon River define much of the country's northern and southern boundaries but the western border follows no natural patterns and follows a straight north-south line through lowland forest and highland plateau. The north of Belize consists mostly of flat, swampy coastal plains and in places is heavily forested. The flora is highly diverse considering the small geographical area. The south contains the low mountain range of the Maya Mountains. The highest point in Belize is Doyle's Delight at 1,124 metres above sea level. Belize City is the largest city in Belize and the hub of cultural and financial activity. Belmopan is Belize's capital. The small city was constructed as a replacement capital after a hurricane devastated Belize City in 1961. San Ignacio - in the central west, gateway to Guatemala and interior of Belize. Punta Gorda - The main town of Toledo District and gateway to Guatemala. Belize is most famous for its fantastic beaches, islands and all sorts of activities you can do while based on one of these islands or beaches. Although the mainland beaches are ok, most people go and visit the cayes just offshore. The most popular ones are Caye Caulker and Ambergris Caye but there are hundreds to visit and from here you can do numerous day trips, mainly to go out snorkelling and diving. Belize is famous for its 'Blue Hole' near Ambergris Caye. For more information about both, visit the Ambergriscaye website. The Belize Barrier Reef is the second biggest barrier reef in the world after the Great Barrier Reef in Australia. Belize’s barrier reef, which extends from a few hundred yards to as much as 40 kilometres offshore, stretches 250 kilometres from tip to tip. It is a great place to go snorkelling or diving, with many sites as The Blue Hole and Shark Alley. Like many other neighbouring countries such as Mexico, Guatemala and Honduras, Belize boasts an impressive amount of Mayan Ruins. Still, unlike its neighbours they are less visited as many people stick to the islands and beaches of the country. Mayan ruins include Altun Ha, Cahal Pech, Caracol, Lamanai, Lubaantun and Xunantunich. Of these, at least the trip to Lamanai is probably one of the most impressive and the ruins themself don't disappoint either. It is best to base yourself in Orange Walk Town in the north of the country and do a (multiple) day trip by car and boat. Monkeys, birds and crocodiles will accompany you and you will able to visit indigenous people and even some Menonites. Caracol and Lubaantun are impressive as well. Many ruins can be visited while based in San Ignacio in the central west of the country towards the border with Guatemala. From here, even Tikal in Guatemala can be visited. In Toledo District, the much less visited deep south of Belize, it is possible to spend many days staying in numerous Kek'chi, Mopan and Garinagu villages with local family homestays. Organized by the Toledo Ecotourism Assiociation (TEA), visitors can experience the day to day lives and culture of local communities, from cacao harvesting in San Jose to Garinagu history in Barranco. Based on a rotation system, members of each community will take turns in lodging, being guides, providing meals etc, as a way of distributing the resources tourists can bring throughout the community. Belize has some splendid national parks and sanctuaries. Although spotting larger animals like predators (the jaguar for example is very elusive) is very hard, Belize has some tropical creatures you will definitely see. These include several species of primates, many birds including the toucan, frogs, reptiles, crocodiles, butterflies and unfortunately lots of mosquitoes. The aquatic wildlife is just as impressive with sharks, dolphins, whales and rays being the larger ones, but numerous colourful but smaller fish are to be seen as well. You won't be disappointed when combining some inland parks with the underwater world of the country. One of the highlights is Cockscomb Basin Wildlife Sanctuary. A highlight of virtually every nation in the Caribbean region, Belize is no exception. Every February, the week before Lent, Ambergris Caye transforms into a huge street party with costumes, parades, music and all kinds of fun for kids and adults alike. Baron Bliss Day honors one of Belize’s founding fathers with a regatta in the harbor next to the lighthouse where the man is buried. Horse races, cycle races and other fun events are scheduled in Belize City along the waterfront every 9 March. Held to celebrate the patron saint of the town in Cayo District, San Jose Succotz is one of the more down-to-earth cultural festivals in Belize. It blends the traditional marimba music, dance and food of the mountainous interior every April. A great excuse to spend a day or two in one of Belize’s top national parks, Crooked Tree Wildlife Reserve is the setting for Cashew Festival every May. The park’s Creole village shows off the amazing cashew in ways you can only dream of, adding to the overall scene. Showcaseing the enduring enchantment of chocolate for three days in the middle of May, arts and crafts complement the informative side of Toledo Cacao Fest that teaches how the ancient Maya used the cacao bean for many purposes. June 14-19 is a chance to indulge in this sumptuous sea creature in every manner imaginable. Coastal communities all along Belize’s coast like Placencia, San Pedro and Caye Caulker all put on a fun day of eating lobster, drinking and having a good time on the beach. One of the premier cultural events in Belize every August, for a week San Pedro brings the heritage of the Maya to Ambergris Caye for an extravaganza of cultural performances, parades and the nation’s top beauty pageant. Celebrateing the arrival of this special ethnic Caribbean group to the southern coast of Belize in 1832, this annual event happens only in the southern towns of Belize like Punta Gordo every November 19. It’s a great chance to see more of this important component of the nation’s ethnic diversity. PanAmerican Day honors the Mestizo culture of Belize in Corozal and Orange Walk with revelry, music, dancing, parades and some serious partying every October 9th. Horse races and all kinds of fun run for a week in both towns. Belize has a tropical climate with generally warm to hot weather with high humidity. Temperatures usually hover around 30 °C during the day and 23 °C at night. December to April is the best time to visit because it is the dry and sunny season, while from June to November it is rainy season with occasional hurricanes possible from August onwards. Philip S. W. Goldson International Airport (BZE) is the largest airport in the country and is undergoing an expansion that should be completed by 2015. Once the expansion is completed the airport should be able to handle direct flights from Europe. Due to the number of tourist flying in and out of this airport there are several airlines that have direct flights to quite a few cities in North America and Central America. Philip S. W. Goldson is about 20 minutes drive from Belize City's centre, in Ladyville. The best way to get to and from the city centre is via taxi. A taxi to Belize City costs BZ$50.00 and takes 15 to 25 minutes depending on traffic. Although an airport bus service exists, it is very infrequent and unreliable. There is also a Shuttle Service. Another option is to walk or taxi from the airport to the Northern highway (about 2.5 km) and wait for a bus. The best routes into the country are from Chetumal in Mexico to cross into the north of Belize, or in the west from Flores in Guatemala. You need to buy a permit and insurance to bring your car into Belize and you need to be the owner of the car. There are three official border crossings into Belize, two from Mexico and one from Guatemala (in the west). From both directions there are frequent direct services from Flores in Guatemala and Chetumal in Mexico to Belize City and several other places on the route, like San Ignacio. There are several connections from towns in the south of Belize like Dangriga and Punta Gorda to places in neighbouring Honduras and Guatemala, like Puerto Cortes (Honduras) and Puerto Barrios and Livingston (Guatemala). Services to Livingston are usually twice week, while Puerto Barrios is served on a daily basis. There are also connections between Ambergris/San Pedro and the Mexican city of Chetumal. Another option is the ferry from Punta Gorda to Livingston on Tuesdays and Fridays for US$17. There is a connection between Placencia (via Big Creek) to Puerto Cortes but it doesn't go very often, usually once a week. If you are going to/from Honduras you can take a "water taxi" here's the ferry website. Or check it at Belize Ferry website. It costs US$55 one-way. To Belize (Big Creek & Placencia), it departs Puerto Cortes every Monday at 11:30am (Leaves from "Puente Laguna" (Lagoon Bridge) next to Delfin Restaurant in Puerto Cortes) and to Honduras (Puerto Cortes) it departs Placencia every Friday at 9:30am (Leaves from Placencia Shell Dock). Thed eparture at Big Creek is every Friday at 11:00am. The boat arrives around 2:00pm. There are also water taxis between Dangriga and Puerto Cortes. The “Nesymein Neydy” departs from Dangriga to Puerto Cortes on Fridays. The boat departs about 11:00am. Arrives at Puerto Cortes about 1:30pm. It departs Puerto Cortes on Mondays at 9:00am. It costs US$55.00 one-way. 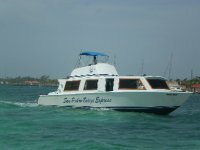 San Pedro Water Taxi offers direct water taxis between Ambergris Caye (San Pedro) and Chetumal, Mexico. Belize Water Taxi offers the same connection and both operate on a daily basis. Maya Island Air serves about 8 domestic cities, including several of the islands off the coast, Placencia and Dangriga. Their hub is Belize City. Tropic Air has roughly the same flights on offer. The Southern Highway from Dangriga to Punta Gorda and the Northern Highway to Mexico are generally in good condition. This also applies to the Belize to Belmopan road towards the west and the Guatemalan border. The Manatee Highway to Dangriga is unpaved and so are most other roads. Renting a car is a good option to get around as distances are not too large. Driving is on the right side of the road. The best places to rent a car are Belize City, as well as Ladyville, Dangriga and San Ignacio. A normal car is mostly enough, unless you want to drive to the far south or into the interior's unpaved roads, which really need a 4wd, especially during the rainy season. You need to be 25 years old to rent a car in Belize and a national driving licence is enough for shorter periods. There are many bus services along the main highways to towns in the north, south and west towards Guatemala. Services are frequent and reliable and there are both older and newer buses with aircon available, recommended during longer trips. There are 3 major bus operators; National, James and BBDC, among other smaller companies. For an overview of schedules and connections, also international ones, see thebussschedule.com. Most important watertaxis are those from Belize City to the islands of the coast like Caye Caulker, Caye Chapel and Ambergris Caye. Check the Caye Caulker Water Taxi Association, San Pedro - Belize Express Water Taxi and San Pedro Water Jets Express. Coastal Express has water taxis around Ambergris Caye. Boats also run from Corozal Town (near the Mexican border) to San Pedro. The “Thunderbolt” departs Corozal daily at 7:00am, and departs San Pedro daily at 3:00pm. Duration is about 2 hours and costs BZ$45 one way. Purchase ticket at the pier before departure. In the south, the Hokey Pokey travels between Placencia and Independence. It departs from Independence daily at 6:3am, 7:30am, 8:00am, 11:00am, 12:00, 2:30pm, 4:30pm (except Sunday) and 5:30pm (except Sunday). It departs from Placencia at 6:45am, 7:45am, 10 am, 12:30 pm, 2:30 pm, 4:00pm, 5:00pm & 6:00pm (except Sunday). There are no watertaxis or other boats/ferries at night. Visas are not required for citizens of EU or Caricom (Caribbean Community) countries, Australia, Canada, Hong Kong, Mexico, New Zealand, Norway, the USA or Venezuela. A permit valid for 30 days will be stamped in your passport when you enter the country. This can be extended by further periods of one month (up to a maximum of six months) by applying at an immigration office. Visas for other nationalities mostly cost BZ$100 (USD 50) from a Belizean embassy or consulate and are valid for a 90-day stay. The Belizean dollar (BZ$) is the national currency. The currency bears the portrait of Queen Elizabeth II and the dollar is divided into 100 cents. Coins come in denominations of one, five, 10, 25 and 50 cents and one dollar; bills come in denominations of two, five, 10, 20, 50 and 100 dollars. The official language of Belize is English. Recognized regional languages are Spanish, Kriol, Garifuna, Kek'chi & Mopan Maya, and Plautdietsch. Spanish is widely used as the first language in northern and western parts of the country. Many Belizeans speak a mix of Creole and English among friends, and full English to foreigners. The strong Caribbean accent may take some getting used to. The primary meal found virtually everywhere is red beans, clean rice, and chicken. Rice and Beans is a mixed dish with some spices and usually coconut milk added to make a sweet and hot staple of the Belizean diet. Beans and Rice is white cooked rice with a side of stewed pinto beans. Belikin is the national beer and comes in four varieties: Premium, Beer, Stout, and Lighthouse Lager. There are no vaccinations legally required to travel to Belize. There is one exception though. You need a yellow fever vaccination if you have travelled to a country (7 days or less before entering Belize) where that disease is widely prevalent. It's a good thing to get your vaccinations in order before travelling to Belize. The general vaccination against Diphtheria, Tetanus and Polio (DTP) is recommended. Also a hepatitis A vaccination is recommended and vaccination against hepatitis B, rabies and typhoid are also sometimes recommended for stays longer than 3 months. Malaria is prevalent in the west and south of Belize and it is recommended to take malaria pills and take other normal anti-mosquito precautions as well. Dengue sometimes occurs as well. There is no vaccination, so buy mosquito repellent (preferably with 50% DEET), and sleep under a net. Also wear long sleeves if possible. The majority of violent crime recorded in Belize is gang related, with a large portion of this occurring only certain areas within Belize City. The high homicide statistics should not be used as a reflection of the country as a whole. The violence is related to narcotic trafficking and the struggle for power in the streets. Theft and assaults are common in some parts of the country. Travelers should maintain a high degree of vigilance. Exercise caution, avoid areas that have obvious amounts of poverty or crime, and Belize can be a very safe and rewarding country. Belize City is the most dangerous area in Belize, although it's very easy to be safe there. Remain in the tourist zone that runs just north of the marina to the southern extension to the east of the main canal. There are plenty of khaki tourist police monitoring the area and, should you have a problem, feel free to approach them. Just exercise common sense and do not go wandering around alone after dark. Stay near tourist areas or other commercial zones. Belize City south side is beautiful as well as dangerous. Otherwise, Belize City is a great place to go if you want to eat, learn, or shop. Under Section 53 of the Belize criminal code, homosexual activity, even between consenting adults, is a criminal offence punishable by up to 10 years' imprisonment, although this law has apparently never been enforced and is currently being challenged in court. Additionally, under Section 5(1) of the Immigration Act, the government is entitled to deny LGBT travelers entrance to Belize. There are also no legal protections in place for victims of anti-gay discrimination in Belize. Internet cafés can be found at most major tourist destinations around Belize. Wi-Fi is also increasingly common, and many hotels are offering it for free. Rates at cybercafes run between BZ$2 and BZ$10 per hour. The general emergency number is 911. The country calling code to Belize is 501 and to make an international call from Belize, the code is 00. Belize has a standardized seven-digit phone numbering system. There are no city or area codes to dial from within Belize. If you bring your own cell phone, avoid roaming charges, as the bill for internet can add up quickly. Instead, use only wifi or buy a local SIM card. Belize Telecommunications Limited (BTL) and their cellular division DigiCell have a virtual monopoly on cellular service in Belize. Luckily, DigiCell does have affordable packages for SIM card activation. Belize's postal service provides services throughout the country. Services are not very reliable though and it might take weeks for a postcard or letter to arrive at your destination. Post offices are generally open from 8:00am to 5:00pm, with a one hour lunch break starting around noon. Most hotels will post a letter for you, and there are post offices in the major towns. It costs BZ$.80 to send a letter to the United States, and BZ$1 to send a letter to Europe. Postcards to the same destinations cost BZ$.40 and BZ$.50 respectively. If you want to send a package, it's better to use international companies like TNT, DHL, UPS or FedEx, as they are fast, reliable and not too expensive. I've been in the tourism industry in Belize for over 3 years, I'm a travel agency from Belize. I've grown in this country, it's my home, I live here, Traveled the country. I live where they would love to vacate. Knowing the country by living here makes a difference from those that had only visited. General information. Accomm, travel, diving, jungle living, hiking, what to see and do, volunteering. Use our map of places to stay in Belize to explore your accommodation options and to compare prices across the country at a glance. To narrow the results down by budget category, use the links below. This is version 75. Last edited at 21:15 on Mar 25, 17 by Utrecht. 50 articles link to this page.